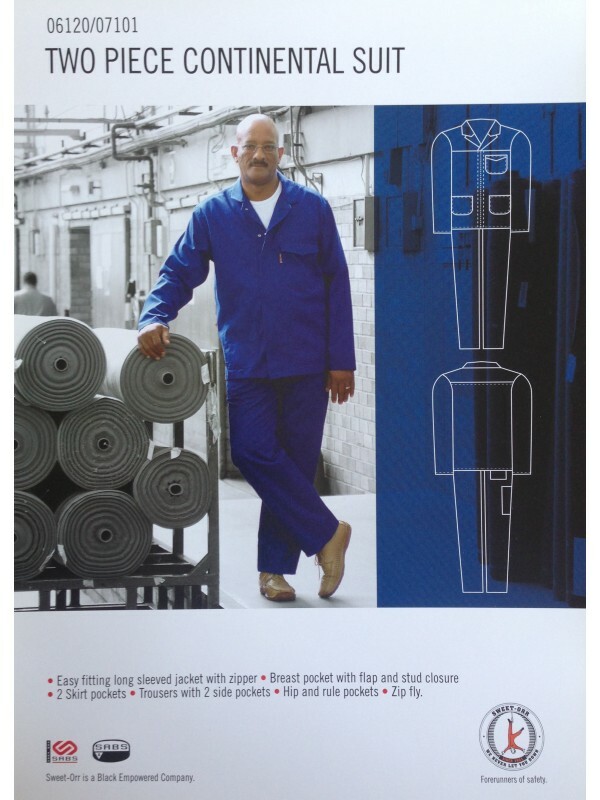 This is a durable Conti suit made of two separate parts, the pants / trousers and the jacket, a two-piece style. This means it will cover your body from the neck down to your ankles and wrists. You can remove the top if needed to cool off or when on a break. It also allows a full range of movement about the waist and is, therefore, more comfortable than a regular overall. This is usually why clients choose Conti suits more often than overalls. It comes in navy blue, and royal blue colours. This is a general purpose extra heavy duty Conti suit as it is made from the thicker 300gm material making the overall last longer and insulate a little more. It has been SABS tested and approved so you can be assured that it is made to the highest standards of quality. It is a tough durable and will last you a long time. It is ideal in any working environment requiring regular protection. This Conti suit is 100% cotton so it is breathable, warm in winter and cool in summer, it has a zip to close the front, making it easy to seal and adjustable for your comfort. It is made from a 300gm material and is SABS quality approved. if you have any questions please feel free to write to us using the contact us page for more information.